Moscow, February 12, Interfax – An organizational committee on the development of the tourist cluster Russian Palestine near the New Jerusalem Monastery in Istra, Moscow Region, has been founded, the press service for the Russian Culture Ministry has reported. “The project is aimed at creating a unified pilgrim, tourist and social infrastructure,” the report says. These issues were discussed in a recent meeting of the organizational committee, which was chaired by Deputy Culture Minister Alla Manilova. The ministry reported that the initiators of the project also intend to seek the inclusion of events aimed at implementing it in the federal program, Development of Tourism in the Russian Federation in 2011-2018. 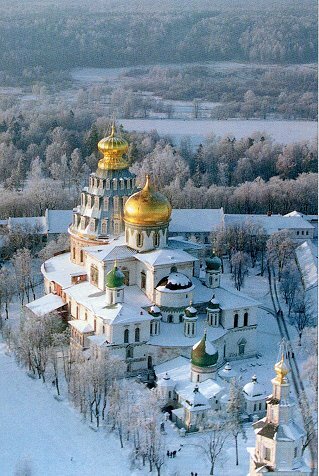 The proposal to create an infrastructure reminiscent of the Holy Land around the monastery was made by Patriarch Kirill of Moscow and All Russia in a meeting of the guardian council of the charity foundation on the restoration of the monastery in November 2013. “One of the sources of funding to cover the costs of this project could be broad development of tourism and pilgrimage. It will be wonderful if the visitors’ program includes not only visits to churches and participation in divine services and visits to restored sites, but also sights for people who are interested not so much in church life, but in architecture and in visits to the Russian Palestine,” he said. “It seems to me it would be the best thing is we asked the Culture Ministry to assist in the development of the Russian Palestine project. It can’t be done quickly. The wonderful fields, meadows and groves should not be covered with artificial new buildings, and Russian Palestine can’t turn into a tourist kitsch, it can’t turn into a Walt Disney Park,” the patriarch said.